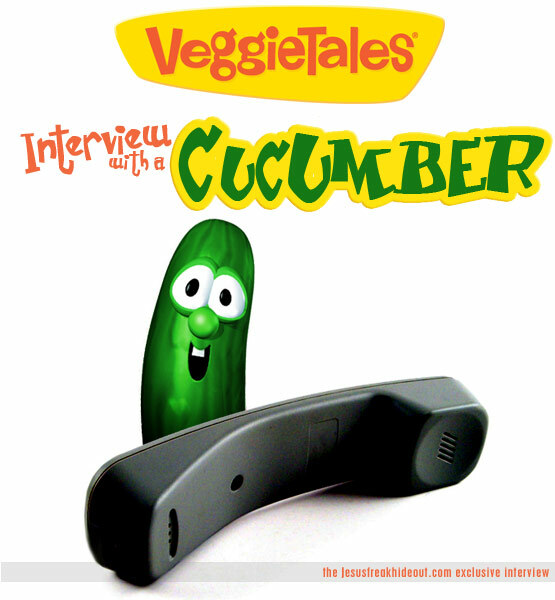 With an all new animated adventure out on DVD, Jesusfreakhideout.com caught up with VeggieTales' own Larry The Cucumber to discuss with the popular vegetable about Pistachio, as well as future projects and just what makes the little green guy tick! This interview took place on: 3/11/10. Larry The Cucumber: HELLO! Hello, John! JFH (John DiBiase): How's it going, Larry? Larry: Hey! 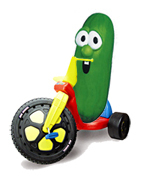 Larry The Cucumber here! Let me tell you, I'm a big fan of the site, Jesus freak Hideout! Love it! Absolutely love it! So it's an honor to talk to ya! JFH (John): Thanks a lot, Larry! Right back atcha, man! Larry: Oh, you bet, man! OK, well, cool! Got some questions for me? JFH (John): Absolutely! To start off, is your real last name "The Cucumber" or is that just a stage name? Larry: Um, well, it is really. Y'know, it's kind of like my age. I've had a really hard time figuring out what it is. I've been to the doctor before and he tells me he can tell me how old I am, but he'd have to count my rings, and I'm just not up for that. So, it's a complicated procedure and I think finding out my last name would also be, so I just go by "The Cucumber." JFH (John): Fair enough. In Pistachio, you had the chance to work with the three little ducklings. What was it like to work with ducks instead of fellow vegetables for a change? Larry: Well, luckily for me, I'm not like corn or anything, cuz then they'd be chasing me around all day. They don't really have a taste for cucumber, so that was good! But they're really nice. They're smart little guys. Greg loves Monopoly! We'd play on the set all the time and he would always trounce us! But Madame Blueberry was the first to get the better of him on that one! But they're super nice little guys. They're really cute! They just kind of follow you around all day. And you turn around and pat 'em on the head and then you walk and you keep going and they follow ya! JFH (John): Have you seen them recently since the taping? Larry: Actually, I'm working on a new project with them right now. They're with Madame Blueberry and we're doing a project called Snooderella. She plays the berrygodmother. And the ducks are her fashion consultants. They're really good at fashion too, surprisingly enough! Larry: Yeah! They're striking too! They wear little berets and little scarfs. Yeah, they do a really good job in that show, too! JFH (John): How was it working with Khalil again? Larry: Ohhhh! He is SO cool! I love Khalil! Y'know, it's been awhile. I think probably since the "Bellybutton" song since I've worked with Khalil. Or maybe even since we did that thing where he told the story of St. Patrick. He was just kind of doing a hand puppet for that one. It's been awhile since I've worked with him, but it was really, really great! He's a really nice guy, super funny, has a little bit of an identity crisis still - y'know, between the worm and caterpillar thing - but he's been working that out though. He's just great to hang around with. JFH (John): Did you do any research into the original Pinocchio story to prepare for your role as Gelato? Larry: Oh, sure! Well, y'know, I went back and I read the original book, the original 1870's book by Carlo Collodi. [I] just really dove into the story. Y'know, the hard thing for me, though, was facial hair, really. So I learned how to carve wood. That wasn't too hard. I started off with soap, like they do in the Boy Scouts, y'know? A lil' Neutrogena soap bar. Carved a little bear. And then worked my way up to puppets after that. But for me, it was just growing a mustache. It took me eight or nine months for that! That was the biggest challenge. JFH (John): Really? So that was real facial hair? Larry: Yeah! That's ALL real! What you're seeing there is 100 percent 3-D digital real! Yeah. It's virtually a real mustache! JFH (John): Now, they had to dye it white, right? Larry: Yeah, that's right. I'm not that old yet! I've got a little bit of gray sprinkled throughout, but I had to take it all the way to gray. Sort of like a reverse Grecian formula. It's hard to find that. Y'know, you can find the Grecian formula to take you all dark, but it's hard to find one that takes you in the other direction. JFH (John): Right. So have you ever been to Italy? Larry: No! I've never been to Italy. But I really want to go one day. And if I go, I really wanna go to Bologna-Salami. But I have been to Olive Garden. And just the salads and bottomless breadsticks. Those are awesome! JFH (John): Those are your favorites there? Larry: Yeah. Absolutely. Absolutely. So my expectation would be that if I do go to Italy, I wouldn't go hungry. But I'd have to watch the content of the salad, because... y'know... eatin' cucumber would kind of freak me out. JFH (John): *laughs* Yeah. Yeah, I would expect that. So that means you actually eat other vegetables then, right? Larry: Well, I tell the kids, "As long as they're not talking, it's great to eat 'em." And I live by those same rules. JFH (John): *laughs* OK, good! Larry: Yup. So yeah, just listen for a little scream on the way to your mouth and if you don't hear it, just uh... continue! JFH (John): Did you have a favorite fairytale growing up? Larry: That's a good one. Let me think. Hmmmm. Let's see here... I kind of like Hansel and Gretel! That's a fun one! Just because of the gingerbread house and the trail through the woods. I try to do that as much as possible, leave a little trail when I go hiking through the woods! But I don't know. That's the first thing that came to mind, Hansel and Gretel! That's a good one. But we haven't done that one in VeggieTales. It might be nice to do that one day. JFH (John): Yeah, that's what I was going to say. Do you think you'll ever do that one, then? Larry: That's a good idea! Here, let me write that one down. I have to figure out how to hold a pencil, though, hold on a second. *pause* OK, got it! JFH (John): Now, for the "Obscure Broadway Show Tunes With Larry," you sing the song "Where Have All The Staplers Gone?" Have you had a lot of office work experience over the years? Larry: Oh yeah! We have our own little office supply thing right over here at Big Idea, and that's really what inspired it. I was looking for a stapler, couldn't find one. I was lookin' in the drawers, looking in the cabinets. I started humming to myself, "Where have all the staplers gone?" (*singing*) Ok, if you can't find a stapler, what's the next thing? A paper clip! Hmmm. Can't find those. "What happened to our paper clips?" (*singing*) Y'know, so that's kind of how it all started. We just have a little bit of trouble keeping all the supplies up to date. It was a good inspiration for a song, kind of like the hairbrush song, y'know, where Bob gave my hairbrush to the peach! Which, ultimately, I was very thankful for because it inspired a great song! So I don't hold a grudge against our office manager about replenishing office supplies. JFH (John): Well that's good! It's good inspiration. Larry: Yeah! Yeah! Just looking for inspiration wherever I can get it! JFH (John): Do you have an all-time favorite Silly Song? Larry: Ohhh wow, well, I really like "Bellybutton," [which] is a lot of fun. I like the boy band I got to be in for that one, Boys In The Sink. Remember that one? So I got together on that one with Khalil also. Worked with him. And that was a fun one. Just the collaboration on that. That was pretty elaborate too. We had like six or seven different sets for that one. So that was cool. Also, I really like "Staplers" because just getting to meet all those office supplies was a lot of fun. Kind of like talking vegetables, which you don't see every day, you really don't see rubberbands with eyes or your staplers with real teeth. It was just nice hanging out with office supplies and singin' a song! So that's a good one too. Let me think of any other ones I really like. Well, of course, there is the hairbrush song. So that one's been around for quite awhile! It's a classic and the kids always ask me to sing that one. I like that one too! JFH (John): Who has been your favorite or easiest co-star to work with? Larry: Well, y'know, Bob is really easy to work with. We're just kind of complimentary to each other. He's round, kind of short, and red. And I'm kind of tall and green. We balance out really nicely. I tend to be a bit more on the goofy side. He's a little bit more on the serious side. So it's very comfortable with Bob. I think, probably, the French Peas. I have the most fun with those guys. Those guys are nuts! JFH (John): Do you have any funny behind-the-scenes stories from the making of your episodes that you can tell us about? Larry: Let's see here. Well, the whale, for instance, we had here at this show (Pistachio), he's a super nice guy and it was really hard to get him to eat all of us, y'know? Cuz at first, he didn't want to hurt anybody. But the producer was there and said, "Don't worry about it! Everybody's fine. They can survive at least three days! So you don't need to worry about it." Y'know, he had done it once before on Jonah. We got swallowed up by the whale. But it was so much like a flashback to Jonah, really. Just goin' inside the belly of the whale again. But we were lookin' all around for angels, couldn't find those. But those three Italian brothers, y'know? Espresso, Milano, and Dorito? Do you remember those guys? Those guys were awesome! They were pranksters, really. Just a lot of spaghetti flying around on the set. Just having a good time! But really, the whole whale thing was a fun experience! JFH (John): What does that whale normally eat then for a diet? Larry: Plankton. Yeah, he eats plankton. I'm sure you've seen plankton before on Spongebob? JFH (John): I have to admit, I haven't watched a whole lot of Spongebob. Larry: Oh, you haven't? Yeah, Plankton's the villain on Spongebob. He's just a little guy, but whales love to eat them. JFH (John): How long does it usually take to complete a VeggieTales story - from the conceptual stage until completion? Larry: Um, that's usually about a year, I think, from the time we get an idea like "Ooo! It'd be a great idea to tell the story of Pinocchio!" to when it actually comes out. Actually, that one lasted a little bit longer, cuz that script sat. We thought about that script for awhile. So that one probably took about two and a half or three years. But we've done other stories in about a year. And there's some that we've done in six or seven months. That's about the shortest. And, like, a A VeggieTales Movie or The Pirates Who Don't Do Anything, that's about five years between when we think of it and when it shows up. JFH (John): Wow! Are there any Biblical stories you haven't explored yet that you would like to in the near future? Larry: Oh sure! We'd love to do a Garden of Eden story. That would be really cool. So we'd love that. Y'know, we finally did the Noah story, which we'd been wanting to do for a long, long time. So I was excited to do that, just with Noah's Umbrella not too long ago. But there's some other stories, like the Garden of Eden, that we haven't done yet that I'd be super excited to do! Let me think of any others... Well, we did the story of Ruth before kind of as a fairytale story, but that one would kind of be nice to do in a Biblical setting. So that'd be fun too. And maybe Paul's missionary journeys. That'd be fun too! JFH (John): What actors have influenced your technique through the years? Larry: Oh wow, well, I studied Methodist acting. So who are some of the most famous Methodists? Hmmm. John Wesley! He was pretty good. And let's see, I liked Jerry Lewis! Cuz I kind of have a Jerry Lewis sort of a voice. "LADY!!!! HELLOOOOOOO!!" So I think he's a little bit of an inspiration, too. JFH (John): He's a Methodist? Larry: I'm not sure!! I think he might be Jewish! JFH (John): *laughs* What is one of your favorite character that you've ever played on VeggieTales? Larry: I really do like LarryBoy! Cuz that's exciting to be able to put on the Super Suction Ears and ride in the LarryMobile. It's really cool! I mean, if you've never had a car you can drive down the road and sprout wings and take off into the clouds, you're really missing out! So I love that! And just being able to swing back and forth between buildings is super cool! And I love playing cowboys. That's a fun thing. Like when I got to do that in Little Joe and also in Moe and the Big Exit. I love a good Western. And really, for me, playing a wood-carving father in Pistachio was also really nice! That was a big stretch for me cuz I never played a father figure before, so that was a lot of fun. JFH (John): Do you think there will be any more LarryBoy adventures in the future? Larry: I hope so! I really do! Y'know, we have a couple ideas that we're working on. So, top secret right now, but hopefully one day we can make another one! JFH (John): Do you think you guys will ever tell the story of how you and Bob the Tomato met? Larry: Ohhh I'd love to do that! Have you heard anything about it before? About the chicken hat company? Larry: Yeah! We have a whole story and we'd love to make it one of these days! It's about how Bob and I met in a small town in Iowa and then got our own TV show and took it from there. It's a really fun story, so I would really hope that we can tell it one day! JFH (John): So has your success and popularity made it difficult to go out in public? Do fans hound you a lot? Larry: Well, y'know, just in general, being a talking, singing, hopping cucumber has always kind of made it difficult to be out in public. I just get a lot of attention that way. There's not many of us talking vegetables around there. But it's nice, y'know, people don't just freak out, they say, "Ooo! It's that cucumber from VeggieTales!" So they don't run away. That's kind of nice. JFH (John): Now, you guys did a Christian Hits covers disc a few years ago. Do you have a favorite Christian music artist…. or two? Larry: I'm a big TobyMac fan! I love TobyMac. I love Steve Taylor! Switchfoot is awesome! Matthew West. I could go on and on. Steven Curtis Chapman. I mean, there are so many great, great Christian singers! I just love, love Christian music! JFH (John): What is your favorite scripture? Larry: I have that right here. It's 2nd Corinthians 12:9 -- "My grace is all you need. My power works best in weakness. So now I am glad to boast about my weakness, so that the power of Christ could work through me!" I really like that because it talks about how it's not about us, it's not about me, it's about Jesus working through us! That's really what it's all about. JFH (John): What is some of the best advice you've ever been given? Larry: Make a lot of noise if someone's trying to eat ya! That goes back to the whole talking vegetables thing. Y'know? I mentioned that. And, let's see... Well, the best advice, which I try to give to kids that somebody gave to me a long time ago that I try to give to kids as much as possible is, "Always remember, God made you special! And He loves you VERY much!" So I think that's probably the best advice I could give anybody. JFH (John): Awesome! Did you have a favorite cartoon show growing up? Larry: Oh yeah! Well, I love Bugs Bunny! That was a lot of fun. He's just really a fun character. I love the Muppets! The Road Runner and Wile E. Coyote. I always loved watching that. And then also, you might be surprised, Speed Racer was really cool! I used to watch Speed Racer and run out and get on my Big Wheel and ride around the neighborhood. JFH (John): *laughs* Do you still have your Big Wheel? Larry: It fell apart. It fell apart a few years ago. Y'know, it's kind of that molded plastic? Y'know, with that little seam down the middle? And after about ten years, it just falls apart. JFH (John): Do you have a favorite vacation spot? Larry: Umm, anywhere where I can get spritzed every fifteen minutes. So, the grocery store is nice. Or if I have a little bottle of water, the beach is great, too. So I like it where it's sunny, but not too hot, cuz y'know, I like to stay cool as a cucumber. JFH (John): What do you like to do in your spare time? Larry: I like water skiing. That's fun. That's something you can do as a cucumber and just hop on one water ski, cuz y'know, snow skiing takes two skiis and I'm not too good at that. But snowboarding, I can do that, so that's nice. I like the luge. The luge is kinda fun. I love reading and hanging out with my friends and just being outside! 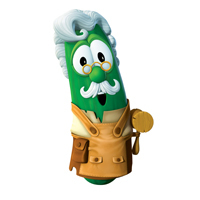 JFH (John): With everything going 3-D in the movies these days, do you think we might see any future VeggieTales stories in 3-D? Larry: Oooooooo! We've been talkin' about that too, so we would love to do that! In fact, wouldn't it be cool if there was a LarryBoy in 3-D? JFH (John): Mmmmm! Yes, definitely! Larry: Wouldn't that be cool? JFH (John): Yeah! Do you think you guys will do any Blu-Ray releases too, as well? Larry: Oh, well, we hope to. We've actually been rendering in high definition for quite some time. But we've been working with iTunes to give VeggieTales in high-def, so you can download it that way. So Blu-Ray wouldn't be too far away because we're already rendering in high definition! It just depends on who would carry it, and all that kind of stuff. But we've been high-def veggies now for probably about two years. JFH (John): With the success and popularity of the motion capture technology used in movies like Avatar, do you think this is something you might use in the future for VeggieTales? Larry: Oooooooo! "VeggieTar!" Wow, where everyone kind of has their own vegetable likeness? That could be cool! I could just go to the grocery store and hook up some sensors onto some different vegetables all around the grocery lane. That could be kind of fun! It might save some time on animation, too! JFH (John): That's what I was thinking! So you said the next project is going to be a take on Cinderella? Larry: Yeah! It's like a VeggieTales princess stories. And so we have Snooderella which is one episode, and the other is called Sweet Pea Beauty. So it's kind of two princess stories. We're really excited about that! I get to play the charming prince! That's gonna be fun! JFH (John): Yeah, that shouldn't be too much of a stretch for you. Larry: I hope not! I'm working on my dashing look, so that'll be good! JFH (John): Do you have any last comments, Larry? Maybe something you'd like to share with someone reading this or listening in? Larry: Well, maybe if I could give people that advice one more time that Bob and I always give? Always remember! God made you special and He loves you very much! Goodbye!!! JFH (John): Thanks a lot, Larry! Larry: You're welcome, John! Nice talkin' with ya!